Trump would dismantle the FDA’s food safety rules? The plan would eliminate some programs he finds annoying, the FDA’s food safety regulations among them. The tax plan, including the FDA provisions, was posted on Trump’s website, but it is no longer there. How did “The Donald” know that my business has dropped over the last few years as the regulatory work of our governmental agencies have kicked into gear. Who knew that food safety would be an issue in this year’s election, let alone Skittles. The latest Salmonella outbreak comes courtesy of Pacific Coast Fruit Company, which produces Taylor Farms Organic Power Greens Kale Medley. Alas, Salmonella do not care whether or not vegetables are USDA Certified Organic—even kale. Coral Beach discusses the details of the investigation into this outbreak at Food Safety News this morning. And food safety lawyer Bill Marler has some pointed questions about this outbreak. 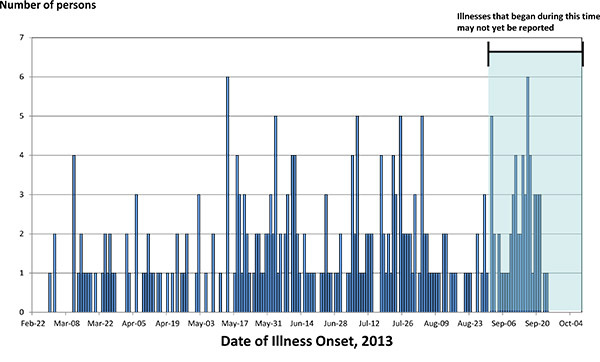 Why no announcement of the Salmonella Enteritidis outbreak? Why no recall of the product? Given that the product was distributed nationwide, are we seeing a spike in Salmonella Enteritis cases in states other than Minnesota? Why was the announcement removed from Pacific Coast Fruit Website? He also has plenty to say about what another recent outbreak (this one due to frozen vegetables contaminated with Listeria) tells us about what is and what is not working in our current food safety system. His essay makes the point that foodborne illness outbreaks due to contaminated meat are becoming increasingly rare. Most current outbreaks are due to contaminated vegetables. How come? For meat, the system is working. Regulation: prevention controls on meat and poultry went into effect in the mid-1990s. The CDC’s ability to track outbreaks is good and getting better, thanks to genetic fingerprinting. Government agencies are doing more testing. Publicity about recalls discourages the public from buying similar products. In sum, “recall costs, slumping sales, along with civil and criminal liability, are powerful market incentives. The FDA Food Safety Modernization Act (FSMA) should help once companies start following its regulations. He better be careful. If he’s right about market forces cleaning up food safety problems, he may get his wish. But we still have a long way to go on vegetable safety, apparently. On my 12th-floor Manhattan terrace, I grow cilantro every summer. I like to have it handy. And I know it’s local, organic, seasonal, and deer-free—and unlikely to be contaminated with Cyclospora. The CDC reports 358 people to be ill with Cyclospora, most likely because they ate cilantro imported from Mexico. I was interested to read Michael Taylor’s comments on the recall of Blue Bell ice cream contaminated with Listeria. Mr. Taylor is Deputy FDA Commissioner for food safety. This outbreak was particularly awful because inspections had found severe violations of standard food safety procedures, yet the company ignored them. The result: people died. the preventive controls for human food rule, if finalized as proposed, would require that companies like Blue Bell have a written food safety plan, based on an analysis of likely hazards, and companies would have to show us that plan during inspections.Listeria monocytogenes is a classic example of a hazard that a company should be controlling. Under the proposed standards, companies would be required to have the right controls in place to minimize hazards and would have to verify that their controls are working. Congress, no doubt, will continue to keep the FDA on a short string. No industry likes being regulated and the food industry fights regulation in every way it can. The FDA needs to do more to ensure food safety but can’t without inspectors. That leaves legal approaches. For these, I go right to the websites of the Marler-Clark law firm, which specializes in food safety cases. May 21: Blue Bell Missed Warning Signs to Avoid Listeria Contamination, Illnesses, Recalls, Layoffs and ? Marler-Clark is filling a critical regulatory gap by suing companies that cause foodborne illnesses and deaths. But this is after-the-fact. As Bill Marler has been pleading since 2007: please put me out of business. Prevention would be much, much better. Hence the need for more FDA resources. 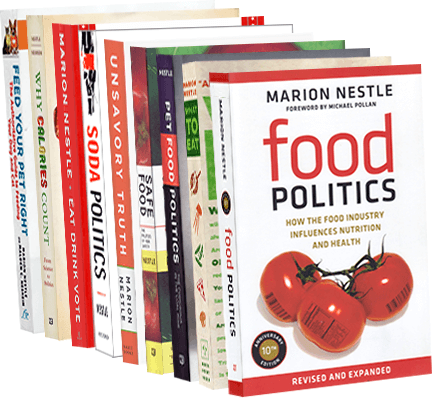 I haven’t said anything about pet food in a while, but plenty is happening with it since my pet food books came out—Pet Food Politics (2008) and Feed Your Pet Right (2010). A few items I’ve collected over the past month or so. FDA regulations: The FDA finally issued its proposed rule for processing standards for all facilities engaged in manufacturing, processing, packing or holding animal feed and pet food. These include Good Manufacturing Processes (GMPs) and risk-based preventive controls (formerly known as HACCP), among other provisions. Safety tips: Food Safety News lists ten ways to make pet food safer—pay attention and follow food safety procedures diligently, for one thing. Double standard: Bill Marler complains that the FDA is constantly announcing recalls of Salmonella-contaminated pet foods, even though few of them result in cases of Salmonella in pets or humans, whereas foods for humans take forever to get recalled even when they cause illness. Pet food recalls: The FDA certainly lists plenty of pet food recalls, and even has a web page for them. FDA oversight: The FDA is on the job and testing. Bravo issued recalls because of potential Listeria contamination. It did so because the FDA says an independent lab detected the bacteria in a sample. Marketing wars: Pet Food Industry, the excellent publication for manufacturers, has a juicy story about the marketing claims war between Nestlé (no relation) Purina PetCare and Blue Buffalo. Each has sued the other. Blue Buffalo has already been called on its advertising claims, perhaps in response to a complaint from Hill’s Pet Nutrition. The ongoing mystery: Pet jerky treats, mostly imported from China, linked to at least 3 human illnesses and more than 1,000 dog deaths and 4,800 dog illnesses, mostly from gastrointestinal problems, liver and kidney disease, and neurological and skin conditions. The FDA says it still can’t figure out the cause, despite 7 years of trying. symptoms in their pets,” said FDA. If we can’t get pet food right, there’s not much hope for human food either. Annals of Government shutdown: What’s up with Salmonella Heidelberg? I’ve been trying to make sense of what’s happening with the latest horrible food poisoning outbreak: this time of antibiotic-resistant Salmonella Heidelberg. Food Safety News and attorney Bill Marler have been following the events closely. They reported that USDA—not CDC (which was on furlough)—issued the Public Health Alert. 278 persons in 17 states are infected with 7 outbreak strains of Salmonella Heidelberg. 42% of them are hospitalized (this is unusually high), and no deaths have been reported. 77% of cases are in California. What does Foster Farms have to say about this? Bill Marler asks how come Foster Farms is not issuing a recall? Good question. Take a look at CDC’s most recent Epi curve. Usually, these show a standard distribution pattern over time with cases rising to a peak and then declining. This one shows no sign of decline. OK, so what, as Bill Marler asks, will it take to close Foster Farms or force it to recall its tainted products? For starters, how about getting the government opened again. And insisting that FDA issue the final food safety rules and start enforcing them. Update, October 11: On October 7, USDA sent three letters of intended enforcement to Foster Farms: Letter #1, Letter #2, and Letter #3. Now, according to a report from Bill Marler, the USDA has decided not to close Foster Farms or force a recall. Dr. Nestle, your statement, “What’s holding up this bill? Nothing but politics of the worst kind,” is absolutely false and you know it. As you well know, there is broad, deep and large opposition to the industrial-size-only approach to food safety that S 510/HR 2749 will make the law of the land….And, once again, I challenge you to a debate of the actual provisions of the bill. Your previous blogs demonstrate a remarkable ignorance of the actual provisions and little understanding of the real world consequences. As readers of this blog know, I believe that all food, no exceptions, from large producers and small, should be produced safely, meaning that producers should follow food safety plans that involve preventive controls. But this comment raises another issue: the unhelpful tone of this debate. Actually, I get more than a few emails like this. Most do a bit better at spelling and punctuation, but nearly all are from raw milk proponents, producers, or consumers (although there are a few from the anti-S. 510 cabal). Some, but not all, have a level of passion that borders on violence. Perhaps not directed at me, but generally in the “do not tread on me”–“tea party” shouting that we have been subjected to over the last year. Frankly, I was perplexed at the “yell fest” that passed for discussion of whether we should expand health care to the 40 million of our fellow citizens without health insurance. I am shocked at how we scream at each other via email or blog comments about raw milk or honest differences about how food safety legislation should be modeled. It is like screaming at and belittling each other at the dinner table–albeit, a very large table. What is with all this anger over food? I mean, honestly, it seems like there are bigger fish to fry. What about the wars? Global warming? Energy policy? But, folks are angry about their view of food–especially the proponents of raw milk (affectionately, “raw milkies”) and the anti-S. 510 folks (affectionately, “organic tea baggers”). Both groups view themselves as victims of big government and big business bent on reducing them to servitude or extinction. They cannot see that perhaps, just perhaps, people who see the dangers of raw milk or the value of S. 510, might simply have an honest disagreement with those that see raw milk as the nectar of the gods or S. 510 as more than a method of lining the pockets of Monsanto. But, hey, that is just me. So, do the yelling, threats and belittling of the anti raw milk/pro S. 510 crowd actually work? Are some convinced that those that yell the loudest have the best arguments? Or, do some simply shy away from their positions after being the target of a nasty blog post or scathing email or comment? I think some do. I know I have been tempted to simply focus on other pressing issues surrounding food safety–there are many–and let folks guzzle raw milk to their heart’s content and let S. 510 die a lingering death. But, that is not my style. Even as a child when told to do A I usually did B. When the raw milk party calls me a tool of big dairy or an ambulance chaser, I come back with reasoned pros and cons of raw milk consumption, videos of raw milk consumers sickened, and a website–Real Raw Milk Facts–dedicated to having a reasoned discussion about raw milk. I am also beginning to work on a raw milk retail sampling project to test its safety. As for S. 510, the nastier the emails from small producers who want little or no food safety regulation, the more money I donate to political campaigns, the more trips I take to DC, and the more often I fund victim visits to their favorite senator. And, to do the above, I hardly raise my voice. Well, once in awhile I do.